Description: Red, thick, hard cover. On the cover the Stadium tower in gold, the Olympic rings and the text HELSINKI OLYMPIA 1952. 107 numbered pages. The slots in the inside covers contain 100 stereo picture slides. In the front cover two slots of slides, the lower one also containing a foldable black metal-framed viewing device. In the front of the device two black lenses, in the back a black frame for the picture slide. 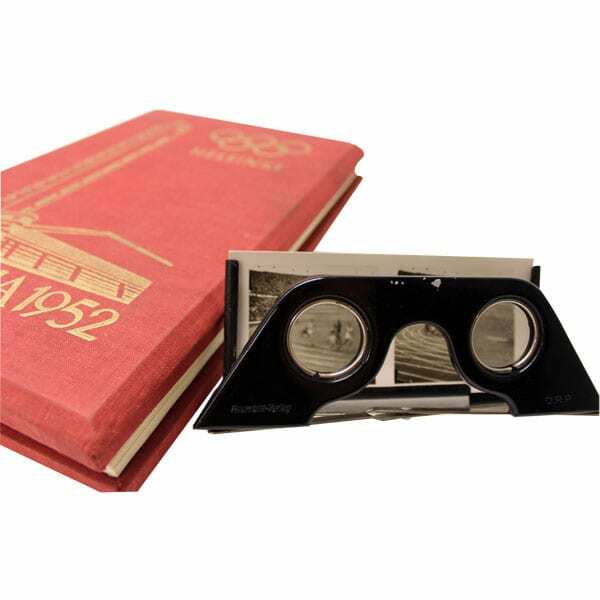 The height of the viewing device is 6.5 cm, the width 15 cm.